Are certain people allowed to post pics or what? Tried to post a pic of my shattered phone screen but the option didn't exist however someone else did the exact same thing? What are you using to access the forums? The best way to post pics is using the desktop site or the Android Central Forums/Tapatalk apps. Posting from my phone utilizing the AC mobile app. Yeah, I think that with the AC main app you can only post pics when starting a thread and not when replying on an existing one. 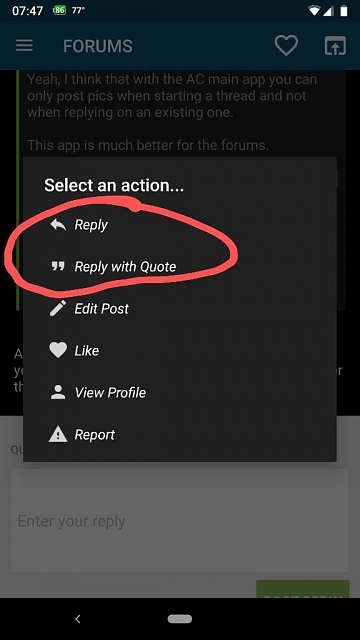 This app is much better for the forums. And if you follow other forums you could try Tapatalk. If you post a lot of pics at once the spam filter could catch it. It varies. Once a year I may post a pic. Appreciate the heads up. Either of these two options works. Although with this method you can only add one photo per post.